This is quiet hard to explain, Because, It is hard to be really neutral, But trust me; This is a huge step toward being really open-minded. As soon as you become neutral when you think about things, You’ll find things so much more simple and easier to understand! It is like looking from a total different point of view. Even the point of view that you hate, totally against and disagree with; Which makes it hard. You know in video games when You change the camera to the sky mode and start looking at things from above. That’s how it is. For years, The humankind have been thinking that the Earth is flat. Until Galileo came up with his theory that the Earth is round. We’re talking about 1 against the whole human race here. And guess what, He was right! But back then no1 have ever never thought that this guy can be right and they are all wrong. 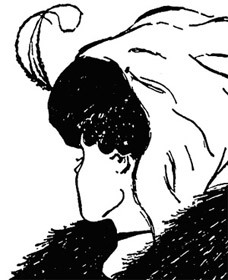 This image above, Some of you will see it as an old woman, And others will see it as Young lady! So… Just give your mind some space and time to think and listen to what the others are saying, But your self in their shoes, Don’t just block your brain thinking that you’re right. Previous post: Skinny girls are NOT hot! Next post: How to change the look of firefox!